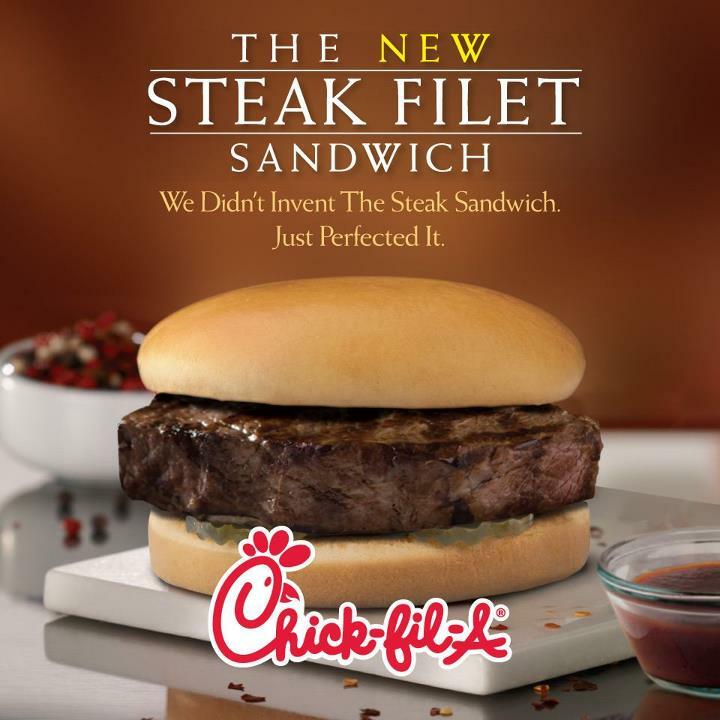 The new Chick-fil-a Steak Filet sandwich. The franchise that redefined quick-service chicken just did the same for steak. Borrowing a page from Apple Inc., Chick-fil-a pulled a fast one on the industry by redefining their market. After years of building an anti-cow campaign, they’ve turned the fast food market on it’s ear with an upscale steak sandwich. Kind of like when Steve Jobs announced the Mac was going to Intel, Chick-fil-a, the franchise that redefined quick-service retail chicken just did the same with steak. We got there right at the opening and after a little cajoling, convinced the manager to cook one up for us. We could tell John (manager’s name) was as excited as we were. The sandwich comes on a slightly toasted bun, seasoned with salt and pepper. It has a hint of mesquite smell to it, though comes across as more liquid smoke than backyard BBQ in nature. The pickles underneath were a surprise. Slightly ridged and a little crunchy, the steak hadn’t made them soggy like we’ve seen on so many other sandwiches. It might be because we got it so fresh. The grade of the beef tasted higher than expected. Though slightly stringy in some places, we did see some marbling. James had a little gristle in one part of his so we can rule out Prime. Served with A1 Steak Sauce on the side, my only wish was that it was a little thicker like you see in the promotional shot. Apparently the new sandwich is being tested in select markets. I’m just glad they have it here in sunny Seattle! Update #2: Happy April Fool’s Day – for those who noticed, Chick-fil-a is not open on Sundays, nor is Seattle sunny this time of year. Big thanks to our friends at Chick-fil-a for the inspiration and source of our “review”. For those who were upset, our sincerest apologies and… enjoy life! It’s funny because Chick-Fil-A is not open today. You realize it’s Sunday right? Chick-fil-a is closed.